Mycorrhizal fungi have a huge potential in tropical agriculture. We apply our research in Colombia and this serves as a model that could be used in many other tropical countries. 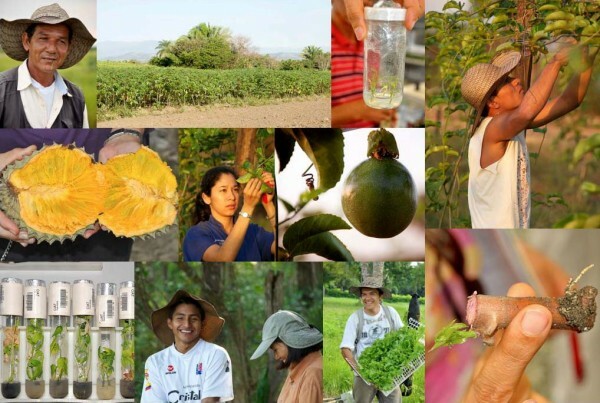 Agriculture is very important for the Colombian economy. Our research in Colombia focusses on trying to use arbuscular mycorrhizal fungi (AMF) to improve yields of crops and reduce the amount of phosphate that farmers have to add to their crops. In most Colombian soils, farmers (from very large- to small-holders) have to add huge amounts of phosphate fertilizer. This represents one of the largest costs to the farmer in all types of Colombian agriculture. AMF can potentially reduce the necessity for so much phosphate application in many Colombian soils, as long as they are used properly. The next pages explain some of the work we have already done in Colombia, the successes, and why we now try and use our research on AMF population ecology and genetics to make this even more effective. Our ultimate goal is to reduce poverty and hunger in Colombia; especially in post-conflict regions like Los Llanos. If it works, we hope to apply this model to reduce poverty and hunger in other parts of the tropics. All our work in Colombia is conducted jointly with Prof. Alia Rodriguez Villate from the National University of Colombia in Bogotá, without whom none of the applied research would be possible.